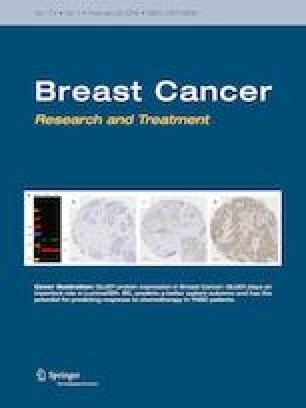 The role of G-protein-coupled estrogen receptor 1 (GPER-1) in the development of tamoxifen resistance in breast cancer is a highly controversial issue. The aim of this study was to determine the expression of GPER-1 in the clinical routine under conditions of endocrine treatment. GPER-1 expression was analyzed in 442 patients with primary invasive breast cancer. GPER-1 score of > 3 was determined as positive. Expression data were correlated with clinical and pathological characteristics and patient survival. GPER-1 expression was observed in 352 (80.9%) cases, and positively correlated with estrogen and progesterone receptor status (p = 0.0001). GPER-1 positivity was associated with an increased grade of differentiation (p = 0.0001) and with a low level of Ki-67 expression (p = 0.0001). High GPER-1 expression was associated with a decreased level upon systemic treatment (p = 0.011). In the whole cohort, GPER-1 expression was associated with prolonged disease-free survival (DFS). DFS between tamoxifen- and aromatase inhibitor-treated GPER-1-positive patients was similar (p = 0.090). Notably, after matching the analysis for the most important prognostic factors, DFS for tamoxifen-treated GPER-1-positive patients was 69.1%, which is a percentage that is significantly lower compared to DFS for GPER-1-positive patients treated with aromatase inhibitors (92.7%) (p = 0.005). GPER-1 expression is a favorable prognostic factor in breast cancer patients. Its predictive role for poor benefit form tamoxifen treatment should be investigated in further studies. The experiments comply with the current laws of Germany and were performed according to the good clinical practice (GCP) guidelines.